At the beginning of 1881, a rumour received currency that the War Office was about to abolish the distinctive tartans of the Highland regiments, and to substitute some new uniform tartan. The rumour naturally roused the feelings of all Highlanders, and an agitation took place in which the Gaelic Society of Inverness took an active part. A brief narrative of this agitation, and our part in it, may be here given. “1. The territorial designation which the regiment should bear, and whether it is desirable to re-adjust the combination of the present linked battalions, having due regard to the extreme inconvenience likely to be caused by such alteration. “2. The record of victories on the colours. Elkington, Major-General Sir Archibald Alison, Colonel 13. Macpherson, younger of Cluny (Lieutenant-Colonel of the 42nd Highlanders) ; Lieutenant-Colonel Briggs, 96th Regiment; and Mr George D. Ramsay, Director of Clothing. While this Committee was prosecuting its labours, the rumour above alluded to spread over the land \ and the agitation was begun. “Clann nan Gaidheal an guaillean a cheile. “Sir,—The proposal by Government to abolish the distinctive tartans of the Highland regiments has caused great uneasiness, not only among Highlanders at home and abroad, but also among patriotic Lowlanders and Englishmen; and the Gaelic Society of Inverness have considered it their duty to appoint a Committee of their members to watch its progress. In consequence of the unsatisfactory nature of the statement made in Parliament by the Secretary of State for War, in reply to Mr Fraser-Mackintosh’s question on the subject, the Committee have resolved to organise a public meeting for the purpose of considering the proposed change, and taking such steps in regard to it as may be resolved upon. The meeting is to be held within the Music Hall, Inverness, on Friday, the 4th day of March next, at one o’clock afternoon, and it is the earnest desire of the Committee that as many as possible of our leading and representative Highlanders should attend. The question to be considered is one which affects Highlanders in a special manner, and looking to the glorious part taken by the Highland regiments in the history of Britain during the past century, and the desirability of encouraging enlistments in the Highlands, it must also be treated as one materially affecting the future well-being of the Empire. “There is perhaps no sentiment that enters so much into the character of the Scottish Highlander, or that has so powerfully influenced- his history as a soldier, as that embodied in the oft-quoted Ossianic precept, Lean gu dluth ri cliu do shinnsir; and hitherto it has been the unvarying policy of his leaders carefully to foster everything associated with his forefathers’ fame, or tending to preserve the history and traditions of the past. Guided by this policy, and knowing his men, Sir Ralph Abercromby, at the battle of Alexandria, incited the Highlanders with the simple but telling words, cMy brave IJighlanders, remember your country, remember your forefathersSir John Moore’s brief address to the clansmen who swept all before them on the field of Corunna was ‘Highlanders, remember Egypt:’ and during the memorable times of the Crimea and Indian Mutiny, the Highlanders’ deep-rooted reverence for the past and its associations were appealed to by Sir Colin Campbell, Sir Henry Havelock, and others, with a result of which history will not cease to tell. During Britain’s greatest struggles, the tartans which it is now proposed to abolish were worn by the Highland regiments and stained with the blood of their greatest heroes; but, notwithstanding this—notwithstanding that the distinctive tartans remind our soldiers of the clans and districts with which their regiments were originally connected, and the brilliant actions fought by those who wore them in the past, and that they have become as dear to them as the colours which they would die to save, and notwithstanding the alarm and discontent which, it is known, the proposal has caused among the officers and men of the regiments interested —the Secretary for War has declared in Parliament that in the opinion of the authorities the time has come for the abolition of those tartans. If this opinion is to be acted upon, there may be a paltry saving to the national exchequer; but the principal link which connects the glorious past of our regiments with the present will be broken, the individuality of the regiment will be destroyed, esprit de corps will be weakened, and the most powerful incentives to voluntary enlistment will be done away with. Our officers and men, although opposed to the change, are not allowed to petition. The people must therefore speak for them. “I have been desired by the Committee earnestly to request jour presence at the meeting on the 4th March. In the event of your being unable to attend, may I ask you to have the goodness to favour me, at least three days before the meeting, with such a letter as the Committee can make use of, stating whether or not you disapprove of the proposed change. While the Gaelic Society was actively engaged in the agitation in the North, Highlanders in the South were no less zealous ; and on 17th February a most influential meeting was held at Stafford House, the London residence of the Duke of Sutherland, where an imitation of the fiery cross was sent round, and resolutions passed to resist any interference with the tartans. This meeting arranged for the presentation of the petition above quoted; and here it may be mentioned that among those who signed it were his Royal Highness the Duke of Edinburgh, 66 other Scottish noblemen, a large number of members of Parliament, the Provosts and Chief Magistrates of 124 cities and towns in Scotland, and upwards of 50 associations, and societies of Highlanders in Scotland and England. The total number of signatures obtained was over 16,000. “Gentlemen,—The petition which you have done me the honour to hand to me deserves all respect and attention, but I take this opportunity—the first which has presented itself to me— to state to you, and through you to those who take an interest in the subject in your petition, that the main designs attributed to us in connection with the uniform of Highland regiments have no foundation whatever in fact. “It has never been my wish or intention either to abolish distinctive tartans or to substitute new-fangled patterns for the clan tartans now in vogue; and, least of all, to diminish the number of regiments wearing the kilt. On the contrary, I know enough of Scotland, and especially of Highlanders, to wish to see the number of battalions wearing these picturesque and popular uniforms increase, and whatever may have been the case in past times, when frequent changes in tartans took place, I am anxious to avoid perpetual alterations in the dress of the army, which for the most part only result in the benefit of tailors. “But it became necessary to consider whether larger regiments should not be substituted for the inconvenient linked battalion system now in force. We consulted the Colonels of Scotch regiments, in order to see how, without making unnecessary changes, regiments with the same uniforms might be formed out of the existing battalions ; and I am happy to say that, when your meeting was recently held, we had arrived at a satisfactory conclusion with respect to all but two regiments. “I hope, when I move the estimates next week, to be able to state that we have reached a complete solution of this intricate question; but, meanwhile, I am glad to be able to give these assurances to you and those whom you represent. “We have considered those recommendations of Colonel Stanley’s Committee (1877) which form part of our reference, and have taken evidence with regard to them from officers of experience, both in the line and the militia. We have also had the advantage of the opinions of Lieutenant-General Sir J. A dye, Surveyor-General of Ordnance, and of Lieutenant-General Sir Garnet Wolseley, Quarter-Master-General. “The first point which has occupied our attention—in view of the proposals of Colonel Stanley’s Committee for the formation of territorial regiments being carried out—has been whether it is advisable to alter in any way the present combination of linked battalions, previous to their organisation in such regiments. As this organisation may be final, it is evidently of high importance to unite in the same regiment, battalions as closely allied as possible both as regards local connection and regimental feeling. “There are several reasons for considering a readjustment of the present coupling of regiments as desirable. In some cases traditional sentiment, in others local considerations, or questions of clothing and uniform, point to the fact that certain alterations in the existing linking would be attended with advantage. 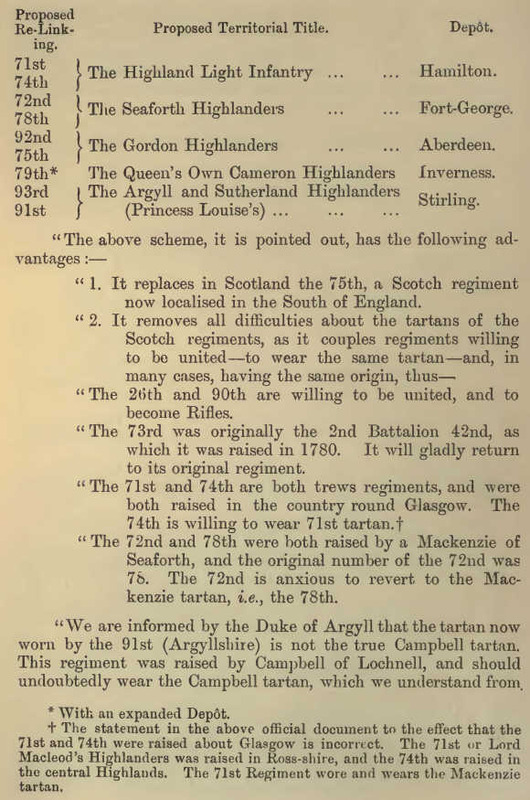 Thus, the 43rd and 52nd, two regiments which formed part of the old light division in the Peninsula, and which are, perhaps, united by closer ties than any other regiments in the service, are separated, while, on the other hand, the 26th Cameronians, a Lowland and originally a Covenanter regiment, is linked to the strongly Highland 74th. As the 26th was originally raised for the purpose of opposing the Highlanders, it is manifest that its regimental traditions, and the feeling which these traditions always engender, must clash seriously with those of the 74th. “Again, at present the 71st and 78th are linked together, the former wearing the trews and the latter the kilt. Such an arrangement added to the expense of the change of clothing when a draft proceeds from the battalion at home to that abroad, is unsightly on parade, and tends to keep up a feeling of separation between the two battalions, detrimental to the proper working either of the present linked battalion system, or to that proposal of territorial regiments. “In Appendix No. III. 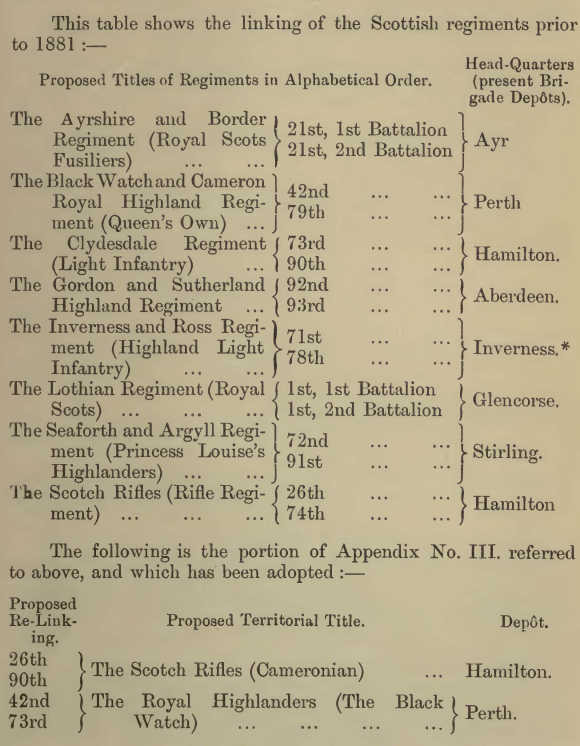 will be found a scheme of re-linking, which it appears to us meets all the cases where it is urgently required, and has the following advantages:—It unites the 43rd and 52nd, and localises the Scotch regiments satisfactorily, doing away with the inconvenience attendant on the localisation of the 75th (a Scotch regiment) in Dorsetshire. It also brings together regiments willing to wear the same tartan, and in many cases having the same origin. It also adds one fresh battalion to those which have to be recruited in Scotland. “On the assumption, however, that the present coupling of battalions continues, we have next considered the most suitable titles for the new territorial regiments. Our endeavour in this has been whilst abolishing all numbers (on the principle laid down by Colonel Stanley’s Committee) to maintain to the utmost everything that bears witness either to the local connection or to the honourable distinctions alike of the line and the militia, which united will form the new regiment. We hope by so doing to preserve, as little impaired as possible, that esprit de corps which is so marked and so valuable in the British Army. But we cannot conceal from ourselves that the fusing together of so many regiments hitherto separate, and the consequent alteration of titles and abolition of numbers surrounded with historical associations will inflict a shock on the feelings of the officers and men of those battalions which thus lose their cherished designations. We trust, however, that this may be temporary only, and that the hope expressed by Colonel Stanley’s Committee may be realised—namely, that in process of time an enlarged esprit de corps will grow up, and that the men of the territorial regiments will look back to the traditions of former campaigns with no less pride than their predecessors. “On the subject of clothing we concur in the recommendation of Colonel Stanley’s Committee, that the uniform of all the battalions of the territorial regiment (whether line or militia) should be the same. This announcement on the part of the Minister of War was hailed by Highlanders everywhere with great satisfaction; and the agitation was at an end. Our meeting at Inverness was called for the 4th March (the day after Mr Childers made his statement), and there was, in the circumstances, little for it to do. It, how* ever, afforded an opportunity for the feeling in the North regarding the question to receive expression, and it is desirable that the same should be placed on record, which we accordingly do. The meeting was .held in the Music Hall, Inverness, and there was a large attendance. Provost Fraser presided ; and on the platform were—Mr Horatio Ross of Rossie; Captain Chisholm, Glassburn; Dean of Guild Mackenzie, the Rev. A. C. Macdonald, Mr Charles Mackay, Mr William Mackay, solicitor; Mr Wm. Macbean, Union Street; Mr G. J. Campbell, solicitor ; Mr Colin Chisholm, Inverness; Mr Fraser, C.E., and Mr Wm. Mackenzie, members of tl:e Council of the Gaelic Society. Among those in the body of the hall were Dr Simon of Glenaldie; Dr Mackay, Ardross Terrace; Major Fraser; the Rev. Mr Fraser, Petty; Mr Robert Grant, of Messrs Macdougall & Co., &c.
Mr Childers wrote to The Mackintosh, disclaiming the “ main designs” attributed to the War Office, but, as his letter was not considered entirely satisfactory, it was resolved still to hold the meeting. The statement made by Mr Childers last night in Parliament seems, so far as we can judge from the brief telegraphic report, to have been satisfactory, and it is pleasant to hope that there is now no necessity for taking the main steps for which this meeting was called. At this season the most of our leading Highlanders happen to be in the South, and, owing to the inclemency of the weather (all the railways leading to Inverness being to-day blocked in consequence of the snow-storm), a large number of noblemen and gentlemen, who take a deep interest in our movement, are unable to be with us to-day. Some of them have already taken part in the agitation in connection with the petitions which have been presented to the Queen and the Secretary for War. I have, however, received numerous letters, and as these strongly reflect the deep feeling which exists among all classes against any interference with the tartans, I shall, with your permission, refer to some of them, it being absolutely impossible, within the time at my disposal, to read them all. Lord Middleton expresses regret at being unable to attend this meeting, and states that he is strongly against the abolition of the distinctive tartans of the Highland regiments ; and Lord Archibald Campbell has addressed a spirited appeal, which has already been read to you. Our northern Members of Parliament—Lochiel, Sir George Macpherson-Grant, and Mr Fraser-Mackintosh—have written strongly deprecating the threatened change ; and, as you are aware, Mr Fraser-Mackintosh has taken an active part in the agitation. Cluny Macpherson, himself an old 4 2nd officer, and the father of the present Colonels of the Black Watch and the Sutherland Highlanders, writes that he highly approves of the object of this meeting, in which he takes the deepest interest. The officers who have communicated with me are unanimous in their disapproval. “ I can assure you that no person attending the meeting can more heartily condemn the proposed change than I do. . . .
“I thoroughly sympathise with your object, viz., to preserve each of the Highland regiments intact and distinct, and having served for some years in the 79th, and being adjutant of the regiment, I well know how distasteful to both officers and men any approach to amalgamation was, is, and always will be. . . .
Mrs Campbell, yr. of Lochnell, writes, in the absence of her husband, an enthusiastic letter, in which she states that Mr Campbell’s whole sympathies are with us. Mr Sinclair Macleay, London, writes to say that we have his cordial support. “I earnestly hope that every effort will be made to avert such an untoward and direful measure, which would certainly be most damaging in its effects in quenching that military ardour which has ever distinguished the Highland regiments in all parts of the world. Their hearts would be cold indeed if they did not warm to the sight of the tartan, and the stirring notes of the bagpipes. There could not be any greater discouragement to recruiting throughout the length and breadth of the Highlands and Isles of Scotland than the proposed change if carried out. Mr John M. Nimmo, Wick, writes in similar terms. I am glad to say that the clergy, who are not usually supposed to exhibit a martial temperament, have on this occasion strongly shown their Highland sympathies. The resolution was unanimously carried. Mr G. J. Campbell, solicitor, seconded. The War Office, he said, raised a war-cry against the Highlanders, but the Highlanders raised their slogan in Parliament, and that slogan has been heard, and the War Office has been defeated. (Applause.) I think it speaks very well for the enthusiasm of the Highlanders on this important question of distinctive regimental tartans, that even after the War Office has given in, 500 or 600 of the leading citizens of Inverness and the country round come here to attend this meeting at the middle of the day, on a very bus}7 market day. (Applause.) I have no doubt that had the War Office not given in as they did, we would have had an attendance here of some thousands instead of 500 or 600. (Applause.) We could never allow the distinctive tartans to be taken away and the Highlanders stamped out. The proposal was seconded by Mr Colin Chisholm, and adopted. Stem peaks of granite frown. To victory as of yore. O leave us the badge which in honour they wore. Of men who were noble in deed and in name. Hath victory followed where Highlanders led. From ties which are sacred, O who shall us sever? A foeman is he who our anger would dare. While love, pride, and worth in a Highlander burn. Y our slogan—the tartan and name of your clan!